Reinstall invites you to join us in revisiting PC gaming days gone by. Today Chris kicks an Orc into a thing, then kicks an Orc off a thing, and so on, in Dark Messiah of Might and Magic. Conceived as a sequel to Arkane’s debut game, the ruminative dungeon RPG Arx Fatalis, Ubisoft’s money brought with it the Might and Magic licence. Yet being tied to a relatively sedentary roleplaying series doesn’t appear to have dampened Dark Messiah’s spirit at all. You get the impression that this is a journey that Arkane was on regardless, its adventure craft evolving as it meandered from Arx Fatalis’s buried ruins to Dishonored’s blood-slick ballrooms via this strange holiday in the D&D-ish kingdoms of Ashan. It is spectacular fun; exuberantly brutal to the point of subverting the vanilla fantasy setting it occupies. It is to videogame high fantasy what John Cleese’s Lancelot was to that wedding party in Monty Python and the Holy Grail: they share an idiom. Dark Messiah echoes Dishonored in the small details. Sareth and Corvo climb chains in the same way, hauling themselves upwards with a gratifying clunk-clunk-clunk that sells the physicality and athleticism of their adventures. They chop pieces off people in the same way, too: someone at Arkane sat down one day and outlined the specific way in which swords should connect with necks, the drop to slow motion that should occur at the precise point of impact, the whoosh and pained shout as first air then flesh splits as an opponent’s head comes free. They’re grim things, sometimes, these games. Yet Dishonored has something to say with and about violence that Dark Messiah does not. Dishonored is a revenger’s tragedy: it’s about the ways in which violent conditions reproduce themselves, and it stretches to give players the freedom to subvert that pattern if they choose. Its violence is a poisoned chalice left on a table for players to consider, consume or ignore. This game loves murder. As soon as the tutorial finishes, it deposits you in an arena where anonymous swordsmen rush you from the shadows forever. ‘Kick this one down the stairs!’ the game insists. Dark Messiah’s violence is a less heady vintage. It’s a thick-bottomed flagon of whatever it was that Conan the Barbarian was drinking, intended to be knocked back, smashed over somebody’s head, and replaced. This game loves murder. As soon as the tutorial finishes, it deposits you in an arena where anonymous swordsmen rush you from the shadows forever. ‘Kick this one down the stairs!’ the game insists. ‘Push his mate into those spikes!’ ‘Throw a box at that guy! Now hold down left mouse button and release to jam your sword through his sternum!’ Once you’ve met each of these demands the door to the next area opens and you can move on – or you can stay, you’re told, if you’d prefer to “continue your training”. You might as well leave, because every other room in the world is like this. Every castle and Orc nest is a playground of foes and invitingly sharp decor. No matter how expert you become in Dark Messiah’s systems, it is terrified that you might forget to use them. Tooltips follow you several missions deep into the campaign: don’t forget to kick people off high ledges. Don’t forget that oil catches fire. Don’t forget that a stunned foe can be disarmed. Don’t forget to cut ropes to activate environmental traps. These messages imply the experience of the playtester who aimlessly hacked and slashed from encounter to encounter, and the horrified developers who watched them ignore all of the systems that they’d so meticulously put in place. ‘Don’t get bored’ is one of Dark Messiah’s key messages. ‘Don’t be boring’ is another. Like Dishonored and Prey, Dark Messiah lets you invest points in new skills as you progress. Unlike those games, Dark Messiah’s narrower focus and combat-centric sandbox mean that this system is less concerned with giving you freedom to set you own objectives and more about giving you lots of different ways to achieve the same goal. Its branching endings, while asking you to decide which broad side of ‘Dark’ and ‘Messiah’ you come down on, are not really there to test your morality. They’re there to steer you into multiple playthroughs, and from there into an understanding that each step of Sareth’s quest amounts to a different course in Tony Hawk’s Pro Beheader. You’re being judged on style, here, so don’t just play it as Swordsman Who is Ultimately a Decent Guy. Go back as Archer That’s a Prick, or Ambivalent Wizard, or Guy Who Carries a Spade and Throws it at People. Dark Messiah is also more willing to bash out the epic fantasy hits than its descendants. Castles crumbling under siege, brawls with hulking cyclopes and dragon encounters have retained their impact, and there’s something comforting about the way a fortress of Orcs communicates the notion that this is a place of adventure. It has real weaknesses too, however. While Dark Messiah’s wonderful combat has survived the aging process, its writing and art have not. The absence of Dishonored’s sense of style, and of art directors like Sébastien Mitton or Viktor Antonov, is keenly felt: Dark Messiah’s technology is no longer impressive and the world of Might and Magic is not interesting enough to account for the loss. Worse are its character designs, which support a plot that is as derivative as it is faintly embarrassing to re-encounter ten years on. As Sareth you’re a Chosen, somebody running errands for louche wizards, performed with the intensity of actors who don’t quite know how to feel about the fact that they could be doing panto instead. Your loyalties are subsequently torn between Xana, a mostly-naked demon lady who lives in your head (but still tries to seduce you) and Leanna, devoted wizard’s niece and miniskirt-wearing crush next door who is very impressed with you if you rescue her from a pit full of snakes and lethally unimpressed with you if you don’t. This is the sticky and embarrassing end of Dark Messiah’s adolescent exuberance—it was the norm a decade ago but games are better than this now. A couple more years might unlock the camp potential in Dark Messiah’s insistence on repeating the words “The Wizard Menelag”, but it’s not quite there yet. Also, the fantasy-medieval folk you encounter are variously American or from Bristol for no discernible reason save ‘nobody made a creative call either way’. If anything, these problems highlight just how successful Dark Messiah is at evoking a different kind of fantasy through its combat systems. If the fighting and adventuring were anything less than exceptional, then it would vanish into the ocean of games with ‘Might and Magic’ in the title. That hasn’t happened because no other game has come this close to letting you be Errol Flynn in a world full of Orcs. 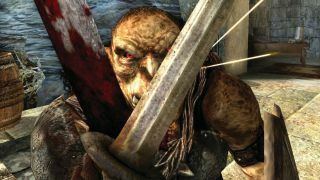 That Dark Messiah now also has value as a milestone in the growth of one of the industry’s most exceptional studios is a bonus, but not an accident.